Golden Boy Promotions put on a live event from the Fantasy Springs Resort Casino in Indio, California. ESPN televised their card and it featured two entertaining bouts, including a bloody main event. The following is a recap of their event. The co-main Event of the evening. A 10 round war! It was a brutal display of heavy shots and relentless pressure by both boxers. Japanese Yoshihiro Kamega stayed true to his form by constantly coming forward and not giving young Vendetti a moment to breath. Greg being the younger guy by 7 years, he held his composure and kept pushing back the Japanese Warrior. From the first round Kamegai pushed Greg Vendetti backwards to the ropes were he let loose heavy hooks to the body and head. The first time for The Villain to go past 8 rounds is a testament the Kamegai’s toughness. Yoshihiro gained Vendetti’s respect form the start of the fight as Greg kept a nice tight guard. Until the 7th round where he seemed to lower his guard and become more relaxed into the fight. Vendetti’s corner was pumping him up in between each round to keep him motivated which was a stronghold to aid his performance. The Villain managed to swell up Kamegai’s left cheek from continued right hands beating him down. Although a lot of heavy shots were thrown and landed, neither man was put down in the fight and it lasted the whole 10 rounds. In Kamegai’s last 5 fights he has landed 24.6 punches per round 39% of them being power punches. But allowing 26 punches 43.8% of them power punches to land from his opponent. This fight was a lot closer in terms of what landed however as Vendetti landed 37% of power punches and Kamegai landed 36% of his. The total punches thrown was 629 for Yoshihiro and 826 for the Villain Vendetti so he was the busier man. A lot of punches were thrown by each man, only 1% difference in what was actually landed, which is closer than the judges had it scored however. Both judges had Greg Vendetti winning by a unanimous points decision, one by 98-92 and the other by 97-93. Vendetti did seem to land the better shots but it was a competitive fight as both fighters didn’t stop throwing the whole fight. Greg ‘The Villain’ Vendetti is at the early stage of his career and will go on to advance to the next stage, performing very well tonight against a seasoned vet in Yoshihiro Kamegai. With it being an entertaining fight, as it was, both boxers can come again I’m sure. An action packed fight with an aggressive fighter being charged by a juggernaut. Andrew Cancio has been working his day job up until the last week of his fight. Having managed to put in the hours in the gym as well. The hungry fighter had a great opening and towards the end of the 1st round he seemed to hurt Dardan Zenunaj with a big right hand. Cancio threw double the amount of punches as Dardan and landed 48%. Round 1,2 and 3 Cancio continued to throw double the amount of Zenunaj. El Chango looked strong and composed even in moments where Dardan put pressure on him. Andrew was landing clean crisp counter punches on the inside and outside. Zenunaj absorbing a lot of punches he was relentless in charging forward. Both men utilised the jab well, Andrew however seemed to find his range better and, in some rounds was landing double the amount of punches than Dardan. The key in this fight was the uppercuts thrown by Cancio. He seemed to be able to land at will to the centre gap in the guard of Zenunaj. El Chango utilised good footwork, evading punches and fighting on the back foot. Zenunaj did land shots of his own however and kept on working throughout the fight. With great conditioning and mind of a warrior Dardan kept pushing forward. He seemed to get stronger as the fight went on, even when hurt he shook his head to allude he wasn’t. He boxed well, cut off the ring and forced Andrew to work. His work rate wasn’t diminished through the rounds but seemed to improved. His pressure was consistent and although behind on points came out in the 8th with a bounce in his step. With only 2 rounds left he and his corner knew they needed to finish Cancio to win. Wanting to finish the fight he carried on showing his massive heart. They went at it in the 9th with beautiful left hooks and straight rights from Cancio but Zenunaj kept coming forward. Andrew was spitting blood which covered the face of Dardan. In the 10th Zenunaj had a lot of success and man handled Andrew. As the crowd cheered ‘El Chango’ Andrew stayed in there, his nose bloodied he bit down on the gun shield and water out until the bell. The two fighters embraced on the final bell and gave it their all. They had a lot of respect for each other and both put on a wonderful performance. The crowd gave them a standing ovation and although not a native of California, Zenunaj seemed to win over the home town crowd of the Monkey. It lasted the duration of the 10 rounds and went to a points decision. All judges in favour of Andrew Cancio. Punch stats were Cancio three 994 and landed 356 (36% pct landed) and for Zenunaj 1062 only 278 landed (26% pct landed). 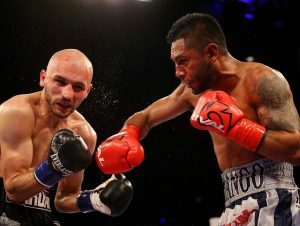 Andrew Cancio has earnt a deserved win, his 19th victory. It makes you wonder What could he achieve if he dedicated his time solely on boxing? Another great fight from 2 tough fighters who displayed pugilist skills and entertained the crowd who were on their feet.